Important update: please read my follow-up review. Lightweight backpackers who are serious about photography face a dilemma: tripods are heavy. I’ve tried various solutions over the last couple of years, but I think with the Trailpix I may be on to a winner. There’s no getting around it – if you hike alone, and want to take pictures with yourself in the frame, you need some kind of camera support. Traditional photographic tripods are heavy by lightweight backpacking standards, even tripods designed to be light; for example, the Manfrotto Off Road weighs 650g. That would make it one of the heaviest items a lightweight backpacker would consider carrying. It’s actually heavier than my shelter! If you want to go lighter, there are hard compromises. Lighter full-height tripods tend to be either extremely flimsy or extremely expensive. I tried a Velbon Summit tripod (458g) last year but it was just unusably bad, and bounced around as if it were made of elastic bands. I returned it. Much shorter tripods exist. I have used a Pedco Ultrapod II (119g) since 2015, and it is very good for what it offers. The big problem is that the tripod is only a few inches high, which severely limits its usability on the trail. 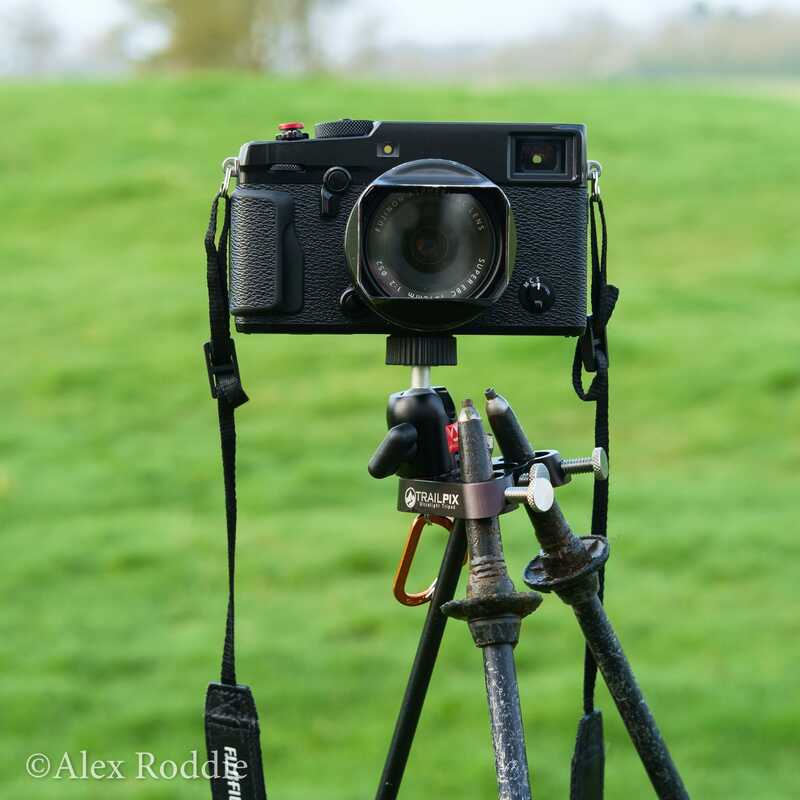 In practice, I often need to find a rock or stone wall to balance the tripod on. After nearly two years of trying to make the Ultrapod ankle-height tripod work, I have come round to the view that a full-height tripod is an absolute requirement for the kind of photography I do on the trail. My needs aren’t particularly demanding. 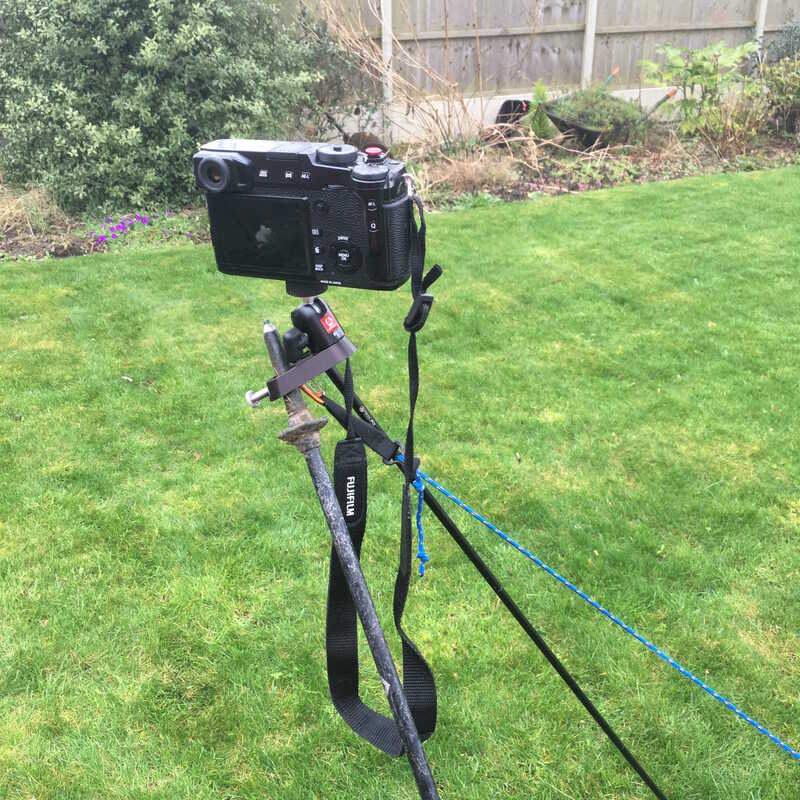 I do not require an absolutely stable, vibration-free platform for making pin-sharp landscapes, time lapses or long exposures in windy conditions. 90% of the photography I do is handheld; all I need is a full-height support for the occasional shot with me, my shelter, or both in the frame. A tripod is an essential item when I need it, but I only need it occasionally on the average backpacking day. That means I am very reluctant to devote more than 4-500g of pack weight to a photographic tripod. I just need a simple support that’s stable enough while being as light and compact as possible. The Trailpix is an innovative solution that takes advantage of multi-use gear you’re probably already carrying: your trekking poles. It consists of a small metal plate and a ballhead. When fitted with two trekking poles and a collapsible accessory pole (or three trekking poles), you get a barebones full-height tripod. The configuration I opted for weighs 233g (excluding the weight of the trekking poles). Since the Trailpix is adjustable, you can use pretty much any trekking pole – although I think 140cm poles are best, as this is the length of the accessory pole. You could always make your own legs out of old tent poles or the equivalent. Stability is surprisingly good. There is a little vibration, and I think moderate winds would make things a bit more difficult, but I have no doubt that it will hold my camera for my basic needs with no issues. It qualifies as ‘stable enough’ in my opinion. Advanced users – especially those wielding heavy full-frame DSLRs – may disagree and will probably need a much beefier support. It is also possible to set it up with only two poles and a guyline, in a sort of counterbalanced pose. This is significantly less stable, but it’s usable in a pinch. I have yet to fully field test this item, but first impressions are great and I think this is going to be exactly what I’ve been looking for. Disclaimer: I purchased this item with my own funds and have no relationship with the manufacturer.